Cologne’s SPAM tapes introduces me, yet again, to a bunch of whacked-out sound-goats who’ve been chugging on at this lark for ages. I’m blind and I’m humbled! Kiko C. Esseiva, a Swiss/Spanish electro-acoustic artist is first out of the traps with a mysterious pot of gunk inlaid with grease, buzz and tin apples. The two sidelong pieces (‘Zenith Larsen’ and ‘Nadir Larsen’) crackle with a fairly dark energy, juggling taped grot with live (or live sounding) interventions on cracked gongs and bicycle wheel. Like eavesdropping on a light machinery workshop the sounds move to their own logic, cutting out and starting up when the unseen controller sees fit. You’ve just got to keep your fingers clear of the whirling blades eh? But this never sounds grim… almost at the end of side one there’s a glorious smear of ant-noise and cyborg humming that makes me click my fingers like I’ve remembered an old magic trick. Side two (‘Nadir…’) is a thoughtful huff on brass pipe and fingernail tap until some unholy voice-jugger/vibrating clam starts a magnetic earthquake in my stomach. Gosh! This is warped and holy. Magnificent and almighty! I’m having a bit of an experience here as I dash about looking for my headphones to inject this straight into my hungry holes. Of course, the unseen hand turns a dial and we are left in a land of shingle, mournful keys and wretched whirring. Hey… there are worse ways to spend an afternoon right? 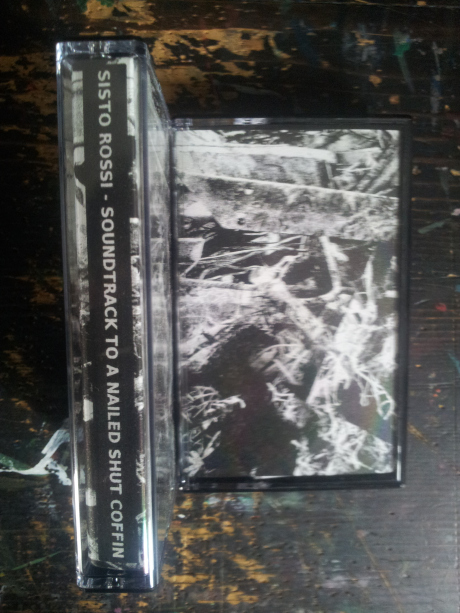 Harsh Noise thinker and instrument builder Sisto Rossi (AKA Wallkeeper) wins today’s prize for evocative tape title with his Soundtrack To A Nailed Shut Coffin. What would you expect from a tape like this reader? Claustrophobic screams? Stiff-armed wriggles and cramped-leg stomps? Bloodied fingernail scratch? Yeah… me too. But I have to report this tape, while stunningly intense and full-on, is almost nihilistically detached in its approach. Sure the buffering roar of noise is filtered into your skull along with the odd broken-crockery rattle but it’s all constructed with a feeling of impotent dread, a slackness, a ‘lost cause’ lassitude that’s strangely affecting. While occasional electronic squalls add a high-end to the relentless churning and asphalt-grazing thunder the base-note is those personal dark thoughts; those repetitive nightmares made so real you can smell the damp earth. The closing moments capture the last fleeting thoughts of expiration – part relief and part regret; bright as 1000 fires but burning out to dead ash in micro-seconds. The sound of lying broken, six feet under and simply giving up. 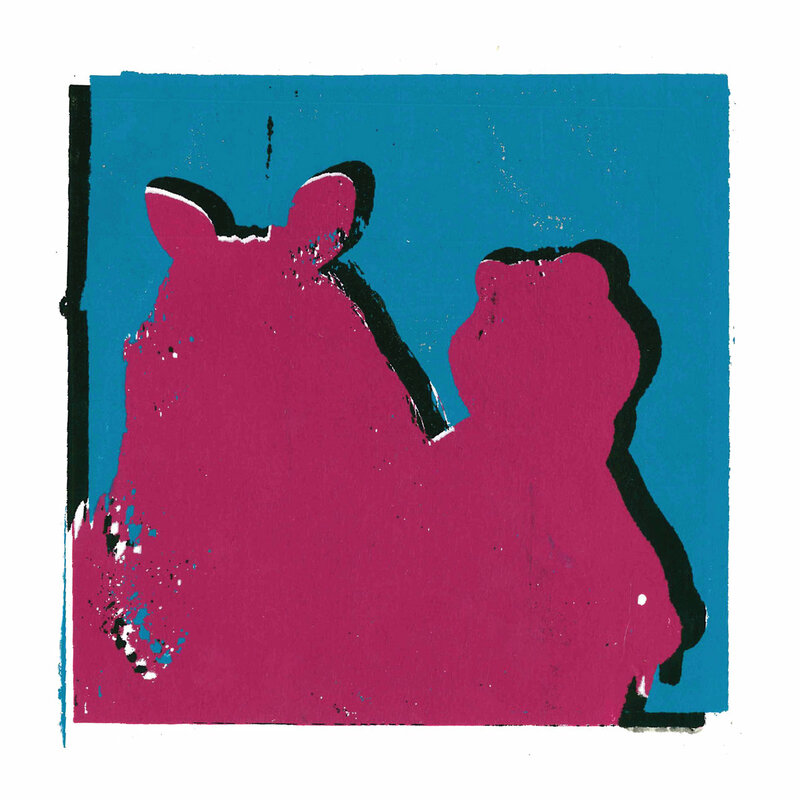 From grimy analogue hopelessness to bright digital cleanliness with Dale Cornish and Phil Julian on their super snappy li’l seven-incher Laughing Out. The title side absolutely crackles with the sort of power and energy that winds up in a filthy-dirty joke told in the Vatican. Shared electronics spit goat fat. It’s dripping wetly on hot coals while Dale sneers it out. he snarls, leading the dear listener on a hectic goose-chase around slack-littered city streets and the hidden canyon of dreams we project onto whatever our reality is right now. But this is in no way ‘dream-y’ readers. The poise and shimmer is as solid as a beard trim and ultra-sarcastic like the very best Glam Rock. There’s still a pair of hobnail boots beneath all that glitter, eh? The ‘b’ side offers us two shorter ham-slaps. ‘For Vocal’ mimics the shattering of optic nerves, made of bruised ice, against a brass pitchfork. Yeah! Very brittle, incredibly sharp and super-cold. The closer, ‘Palazzo’, starts with a dark pulse but soon morphs into a mini mystery play for baritone voice and tight crime-beats. The whole thing, sides ‘a’ and ‘b’, clock in at under 6 minutes; the perfect brevity of a paper cut or punk gob. Taken as a piece of found-sound-art-off-the-pile Murray Royston-Ward’s My Neighbour Who Lives in the City of Mirrors near My House is an impressive enough document. It shudders and ripples, it pops and whines in all the right places. 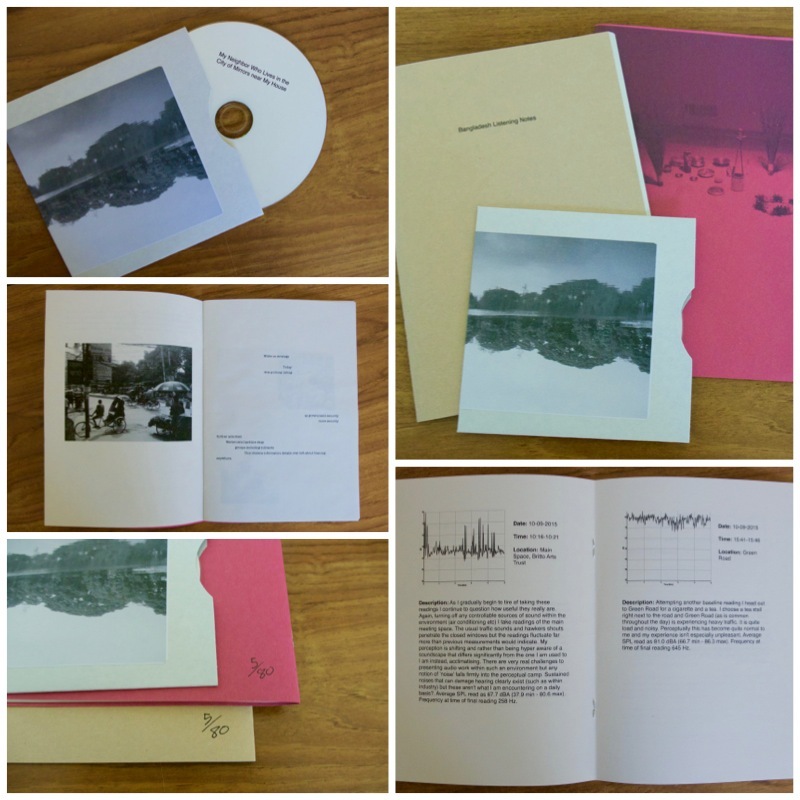 But add to this the rich Bangladeshi field recordings data in the accompanying booklets, outlining Murray’s journey from leafy Nottingham to the other side of the world, and you’re adding another peppering of intention and understanding. On ‘A Very Small Guernica Facing a Rather Large Mona Lisa’ these augmented recordings (a rethinking of what silence actually is) feature the constant urban horn section of tuk-tuks and taxi cabs punctuating Murray’s iron-coated dragnet like exploding garlands. Let’s be clear, Murray’s a master of the clink and rattle: on ‘Topos of Intrusive Sound’ the carefully placed metallic object, dropped shoe or Pringles tube shuffle in and out of your earhole with a customary jolliness. Murray’s top trump has always been his inclusion of careful humour into this sometimes stuffy improv world. But the mood darkens (unsurprisingly) at the ‘Slaughter Livestock Festival’; excited crowds chatter while suspicious cows gingerly cotton on. Every sound becomes pregnant with meaning. A quite innocent washing makes me think of thick red blood sluuushing down the dusty street, a metallic ‘shing-g-g’ the sharpening of a blade. At twelve minutes this is an unbearably tense listen. 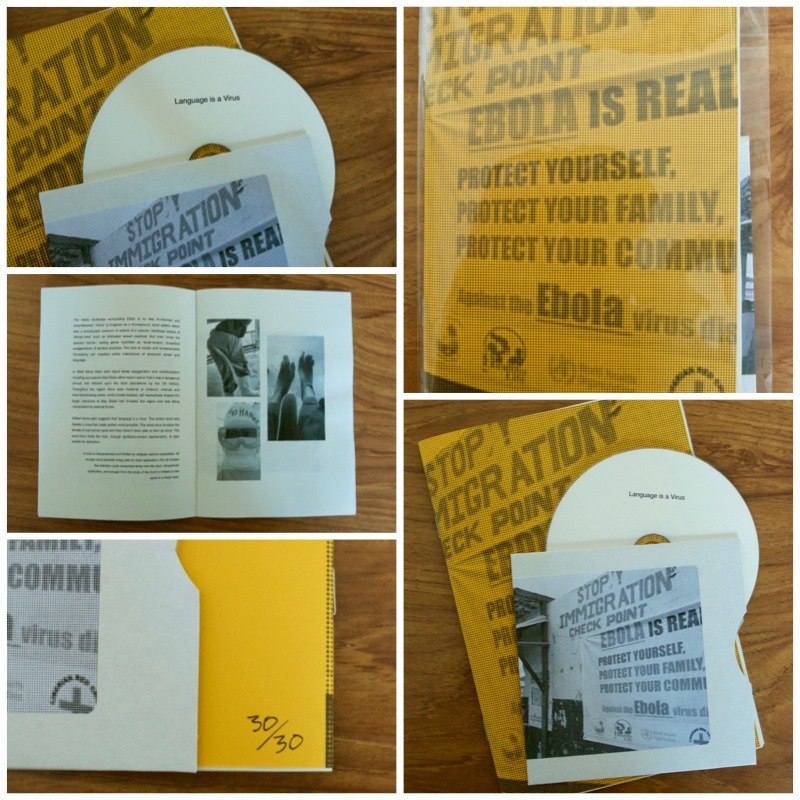 Language is a Virus, a 28 minute spoken word/reportage collage, concerns the myths, prejudices and reality of Ebola; not only the disease itself but its socio-political impact. What makes this hit even harder is the fact source material was gathered by Holly Royston-Ward, Murray’s wife, during her work as a nurse in Sierra Leone. Harrowing, thought-provoking and informative. No smart Alec remarks from me (for once), all I’m going to say is check this out here. 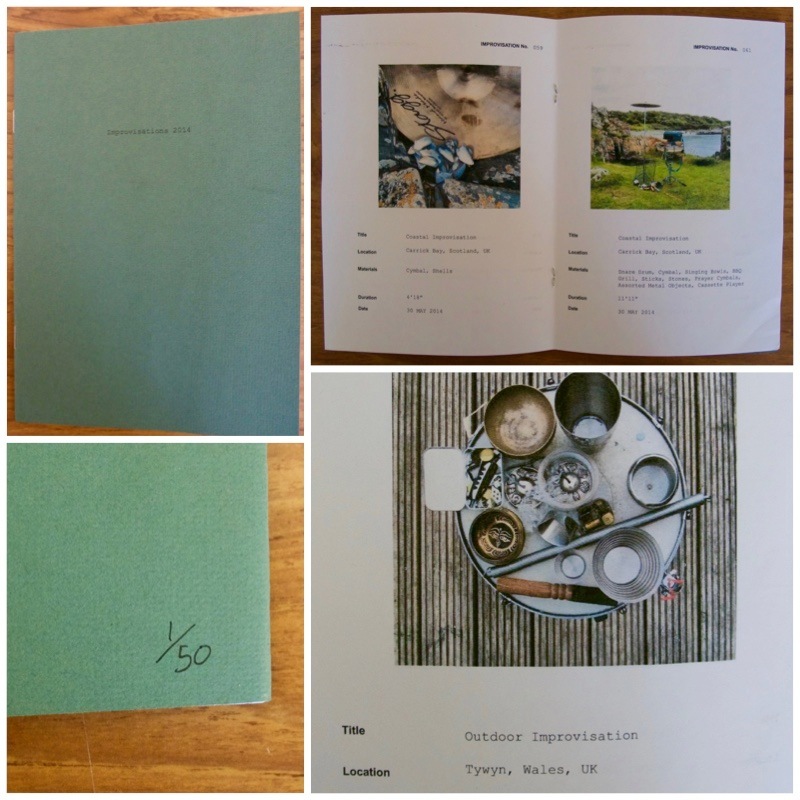 Finally, an honourable mention goes out to Improvisations 2014, an artist book of photographs, locations, timings and instrumentation for imagined improvisations. An interesting experiment, it invites the ‘listener’ to imagine combinations: spring, metal chain, cassette player, prayer cymbal, bait packaging (for example) with no recorded sound to back it up. I’m getting a plink/boing/screee/crackle from this list. What about you? Take a trip with Murray but be sure to flick through images of a 70’s Alan Whicker to get the dislocation vibe spot on.